A new documentary about the life of peace activist Malala Yousafzai, He Named Me Malala, follows the story of Malala and her family before, during, and after she was shot and nearly killed by the Taliban for decrying its denial of education for women. There are many reasons why you should see He Named Me Malala, directed by Davis Guggenheim, who also produced and directed Waiting for Superman and An Inconvenient Truth. The film features interviews with Malala and her family members, includes her speeches and appearances on late-night television and at the United Nations, and explores her impact on global peace. 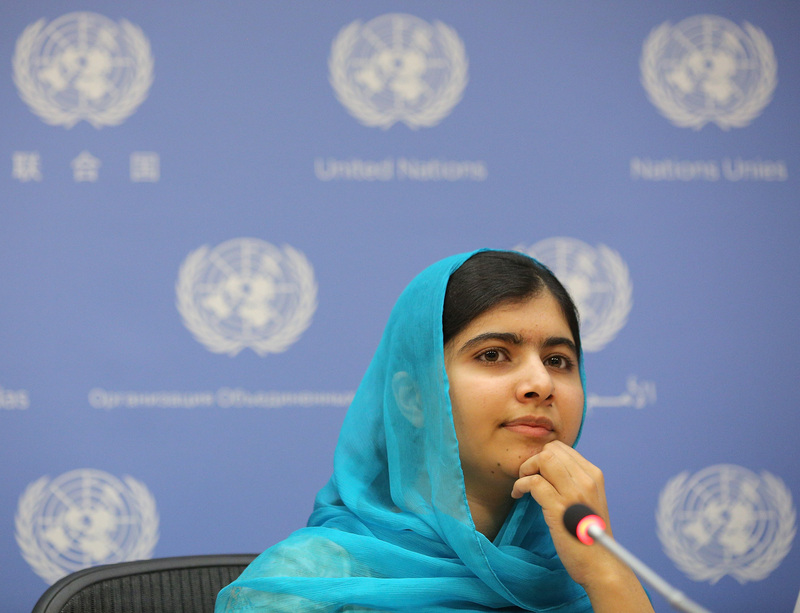 Malala is now famous as an international spokesperson for women's education. She received a $3 million book deal for her life story, which became a bestseller in 2013. But in many ways, she is also a normal teenage girl. She struggles to keep up with homework and bring up her grades, and even gets nervous talking about boys (though she loves to Google pictures of Brad Pitt and Roger Federer). If you don't want to see this documentary for its discussion of timely human rights issues, buy a ticket just to see the heartwarming story of a girl trying to follow in her father's footsteps. Read on for more reasons to see this incredible documentary. The film follows Malala after her recovery from the attempt on her life in 2012. She and her family now live in Birmingham, England, as the Taliban has declared it will try to assassinate her again if she returns to Pakistan. She explains in the film how she misses home, but in England she is able to attend school, have friends, and live life safely. Much of her time is spent traveling around the world (the documentary follows her and her father on trips to Nigeria and Syria) to advocate for the right of girls to attend school. She has appeared on The Daily Show with Jon Stewart, spoken with President Barack Obama, and was invited to meet Queen Elizabeth, among other notable heads of state and countless celebrities. She was named one of TIME's Most Influential People in 2014 and 2015 and received the Nobel Peace Prize in 2014. The movie presents the story of a remarkable young woman whose drive and passion appear to be boundless. In the film, Malala says that 66 million girls of school age worldwide are not enrolled in school. According to The World Bank, about half of these out-of-school girls are from sub-Saharan Africa, and another quarter from South Asia. UNESCO reports that Nigeria, Pakistan, and Ethiopia all have more than 1 million uneducated girls of primary school age. For many of these girls, lack of resources and cultural customs keep them at home, but in recent years, violence and political strife have forcibly prevented women's education in places like Nigeria and Malala's own Pakistan. In the film, Malala travels to Nigeria to speak with former President Goodluck Jonathan about the mass kidnapping of nearly 300 girls by Boko Haram on April 14, 2014. In one powerful scene, she tells Jonathan point-blank that it is his duty to protect his people and find the missing girls. Much of the documentary focuses Malala's relationship with her father, as the title suggests. Ziauddin Yousafzai has been an activist and educator in his own right for years. He founded a school in their hometown of Mingora, where Malala fell in love with education. He spoke out against the Taliban when they began arresting and killing people in the Swat Valley. The documentary shows him explaining that it is his duty as a Muslim to speak out against those who hurt people. When Guggenheim asked Malala in the film if her father encouraged or pressured her in any way to speak out against the Taliban, she firmly denied this. "My father only gave me the name Malala. He didn't make me Malala," she says, emphasizing this point. She independently chose to follow in her father's footsteps by appearing on camera to denounce the ban against girl's attendance at school. "I chose this life, and now I must continue it," she says. She is a normal teenage girl in many ways. She giggles and blushes when asked if she would ever ask a boy out on a date. At her new school in England, she sometimes earns 60s and 70s. These details humanize the girl behind the icon. So does the documentary's depiction of Malala's family. The Yousafzais are portrayed as a supportive and close family. Viewers see Malala and her family at home relaxing, eating, and playing cards. Her parents encourage her to state her opinions. She playfully bosses around her two younger brothers. She is the boys' equal within her family dynamic. Her mother chooses to cover her face when in public, but Malala does not because she feels it masks her personality. Her parents support this decision. Malala is drawing attention to millions of girls around the world who are denied education. First Lady Michelle Obama recently announced her new campaign "Let Girls Learn," which vows to remove barriers that keep adolescent girls worldwide from attending school. The movement is getting traction, thanks in large part to such initiatives. "One child, one teacher, one pen and one book can change the world," Malala said to a United Nations youth assembly in the documentary. She means what she says, and she'll make you into a believer, too.